My PhD advisor, Olle Pellmyr, passed away in December after a long illness. After attending his memorial service in May, I wrote down some thoughts about how I ended up in Olle’s lab, and how he decided I was a good prospective student — the result was published last week at The Chronicle of Higher Education. How on earth did Olle, who passed away last December, decide I was a good bet for five or six years of his time, attention, and grant funding? It’s hard to believe my early performance in graduate school could have allayed any lingering doubts about me that he might have had. For most of my first semester I mispronounced his name to his face, until a postdoc in the lab finally took me aside for some coaching on Swedish vowels. I made an abortive attempt on a dissertation project with a species Olle had never studied, a wild geranium that sprouted well enough in the greenhouse but then died inexplicably (to me) before it was any use for research. My probability theory class was a near-death (well, near-C-grade) experience. 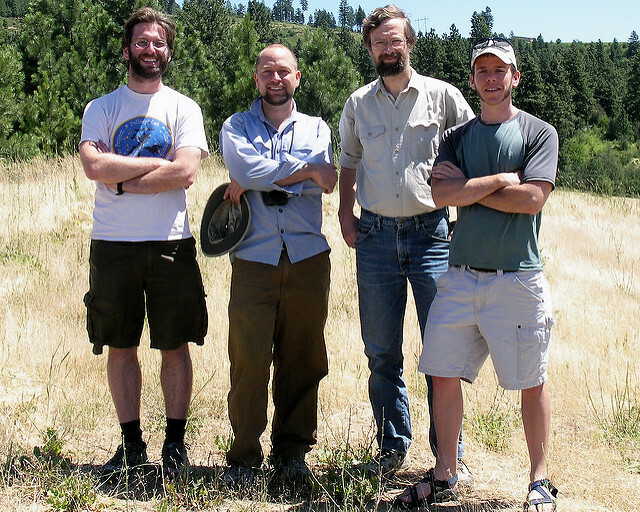 Featured image: Members of the Pellmyr lab in 2008 — grad student Will Godsoe, postdoc Chris Smith, PI Olle Pellmyr, and grad student (yes) Jeremy Yoder.